Diamondbacks' pitcher Josh Collmenter delivery is odd in comparison to the rest of the league - it certainly got one Write Fielders' attention. LIVINGSTONE: After watching the Jays drop the series finale of the opening weekend series to the Cleveland Indians 4-3, The San Francisco Giants and Arizona Diamondbacks game came on and after watching Josh Collmenter throw his first inning, I had to sit down and write about him. In the many years I’ve watched baseball, there are a number of unorthodox pitchers that come to mind – Hideo Nomo with his near corkscrew pitch delivery, Giants Tim Lincecum with his rocket launchpad approach, Brad Ziegler and Peter Moylan’s submarine-style delivery, the list could go on. But looking back over the years, I can’t think of anyone with a delivery like Collmenter. While his delivery isn’t as, well, below the belt as the submarine, it is less than normal. When he throws a pitch – either the fastball or change-up, both pitches he relies on heavily – his arm looks like that of a cricket bowler (ie: the guy who launches the cricket ball), a near-mechanical looking delivery. Coming out of his wind-up, his arm doesn’t sit outside his shoulder, but seemingly right in line with it. The over-the-top delivery is uncommon in baseball and certainly can be deceptive to hitters. There is a certain amount of expectation surrounding Collmenter. Since his days pitching for the Homer High School Trojans, where The Homer, Michigan native put up eye-opening numbers. 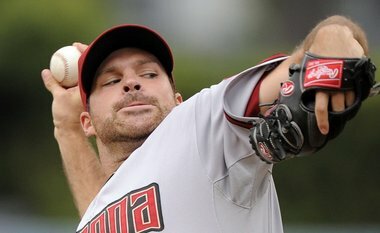 Collmenter won 18 games in the 2004 season, the third highest total in state history. He recorded a state-record 13 shutouts that season while striking out 223 batters and notching a 0.13 ERA. Collmenter finished his High School career with 49 wins, 23 shutouts, 546 strikeouts and a 0.99 ERA, all of which rank in the top six in state history. His minor league stats weren’t nearly as lights out – he went 45-27 between 2007 and 2010 with one Trilple-A appearance in 2011 before being called up to the Diamondbacks – but they were enough to get him a spot in the starting rotation where he went 10-10 last season, striking out 100 in 154-plus innings, helping the D’Backs win the National League West division. He’s a fun kid to watch pitch and with some work on refining his curveball into a quality breaking pitch to compliment his fastball, change-up and cutter, Collmenter will be a top-three starter during his career. That all said, I want to fast-forward back to the Jays opening series, briefly, to spare our readers the saturation of Jays talk. Despite being three games into the season, Jays second baseman – and number two hitter – Kelly Johnson is showing some incredible plate discipline. While he’s 5-for-14 with a home run, he’s got four walks, most of them long plate appearances, drawing it out to eight or nine pitch at-bats before taking his base. The biggest one was in the ninth today against the Indians, taking a walk on a 12 (I think) pitch at-bat with two out to load the bases for Jose Bautista. While Bautista flied out (to the moon) to end the game, it wasn’t a total loss. Hitting in front of one of the most dangerous bats in the game requires you to get on base as much as possible. If the opening series is any indication (Johnson’s OBP is over .500) Bautista is going to have ample opportunity to put runs on the board – or get walked (he’s got four walks in three games), paving the way for Lind, Encarnacion and Lawrie to empty the bases.